Using 457 visas to overcome the lack of trained Australian workers is a Colombo Plan in reverse. The Right-Wing State Governments have all decided to cut education costs, selling off schools for their land, close TAFE facilities. The resulting shortage of skills is being filled with these 457 immigrants. A fair swag of the 457 people are wanted by the big mining companies or their smaller sub-contractors. Not wanting to go into the possibilities of misuse of these visas. The potential for underpaying or not paying all the remuneration Australian workers receive is always present. Of course the big Miners are already finding ways to pay down the wage bill on existing mine sites. “Vehicles moved out of trial into production mine. Rio Tinto will put driverless trucks into a production iron ore mine in Western Australia’s Pilbara region from this month, following a multi-year, five-truck trial in its West Angelas mine. Perth will be the home of all these “remote drivers”. That is good to see. In a lot of ways they are just like the Drone Pilots who fly pilotless drones in Afghanistan, kill a few, hopefully, enemy and go home for dinner. Just like all those call-centres which streamlined customer relations in Australia. All those efficient businesses which employ thousands of of Australians. You know them. You talk with them every time you phone your telecom or your bank. The ones with the Indian Accents. WHOOPS? Indian Accents? Out of Mumbia or some other Indian City? How did that happen? The technology improved. With high-speed, reliable phone and internet connections, the call-centre could be any where in the world. So why not look for the cheapest operators? It is good for business, isn’t it. Call Centres went to India and the Philippines. A lot of Australians lost their jobs. How long will it be before the mining companies go down the same road? After all, we already know that Hancock Mining, run by well-known philanthropist and good parent, Gina Rinehart, likes the idea of African Miners who work for $2 a day. Once the technology is proven and all the bugs are out of the system, BHP, Rio, Forrest, Palmer and Hancock will all be able to dig up OUR minerals, transfer them to a port and load it into the hold of a ship all without an Australian, or even a human, hand touching it. And if the controls are operated in some remote country where the wages are minuscule than it just adds to the profits of the company. It doesn’t matter that 80% of those profits go off-shore because only 20% of the companies are owned by Australians. The miners will no longer need those 457’s. No Australian will be working on a minesite yet the mines will be making ever bigger profits. Think of all the wonderful savings to be made. There will be no need to educate Australians. There will be no need for Superannuation. No need for 457’s because there will be no need for workers. Not even a need for Work Choices. Oops, they are extinct, already, aren’t they! Which is just as well because there will be no tax paid either. No PAYE tax, no company tax. Just this huge outflow of mining money to overseas shareholders. The 457 Visa debate will suddenly become redundant. I enjoy Twitter and the gossipy goodness it brings. I found that Tweet Deck gave me the functionality I wanted and life was good. I recently upgraded my bright, colourful but apparently old-fashioned version of Tweet Deck to the new black and white version with no skin-changing ability. What was wose, it came with a built-in, unchangeable, annoyingly loud BEEP whenever any new tweets arrived. I had a choice. I had Tweet Deck operating OR I could have other sound things, like You Tube, Music or Skype operating. Actually, I don’t use Skype but I like to sound as geeky as possible. OK – the Black and White I can live with. But that Beep. Something had to be done. The following works with Windows 7 Home Premium. There may be some changes needed to make the following work. I had a feeling that if I was to change this file I may solve my problem. I now have an almost silent Tweet Deck and I can play twitter stuff while listening to music. Ain’t technology (and work-arounds) great? Who was Michael Stern Hart? 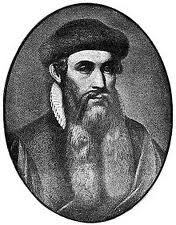 He was the Johannes Gensfleisch zur Laden zum Gutenberg (c. 1398; February 3, 1468) of the 20th century. Gutenberg invented mechanical movable type printing started the Printing Revolution and is widely regarded as the most important event of the modern period. Michael Hart (March 8, 1947; September 6, 2011) invented the eBook and began the modern information revolution. A student at University of Illinois, Hart was given a computer account on July 4, 1971. Wondering what he could do with it, unlike other users of the time who used the gestating internet for data distribution, Hart chose to use his computer time for information distribution. Typing in the American Declaration of Independence, he discovered that it would crash the system if he was to email it to everyone on the ‘net. As an alternative he made the text available for people to download instead. This was the beginning of what he was to call Project Gutenberg which became his lifelong work. He continued by adding such classics as the Bible and the works of Homer, Shakespeare, and Mark Twain. As of 1987 he had typed in a total of 313 books in this fashion. In 1987 he was able to set up a series of “mirror sites” and mailing lists and so was able to recruit help in the work. Now, in the week of his death, the Project has over 36,000 books available for free downloading. All are out of copyright. From his unformatted style of creating eBooks, the Kindle, Nook and other modern eBook readers developed their proprietary formats and, as the 15th century Gutenberg was the father of the printed book so the 20th century Hart was the father of the electronic book. 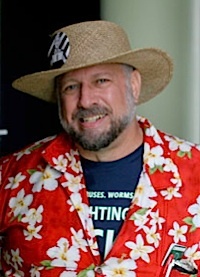 While others were sharing data across the newly networked computers of 1971, Hart had a vision which not only led to his vast collection of eBooks but also paved the way for blogging sites like this. Vale, Michael Hart, and thank you.. I own a few shares in the mining company which is about to start mining the largest deposit of Rare Earths outside China. Those shares are accumulating value very nicely as China has closed off access to its 97% share of the worlds Rare Earths. This is a microcosm of Australia’s mining boom. We Aussies are digging up our countryside and flogging it off to the highest bidder. This has insulated us from the worst of the Global Financial Crisis. With huge markets developing in China and India Australia looks set for several decades of un-interrupted prosperity. Possibly even longer. Until a new technology which will ruin the dream within twenty years crept up on us. Up until now, all mining throughout the world has been in full view of the public. Even in remote and dangerous locations we have had access to news and images of the necessary damage being done to our land. Whether in Australia, Africa or anywhere else on the surface of the Earth. This has meant that mining companies have had to spend money on royalties, taxes and to protect, in some small way, the environment which is of concern to all of us. Out of Sight and Out of Mind would be a much cheaper way for mining companies to go. Not the fanciful “Asteroid Mining” option which was put forward as we began to explore the Solar System. Going down will be the way of the future. But not in mines! Japanese researchers say they have discovered vast deposits of rare earth minerals, used in many hi-tech appliances, in the seabed. The geologists estimate that there are about a 100bn tons of the rare elements in the mud of the Pacific Ocean floor. 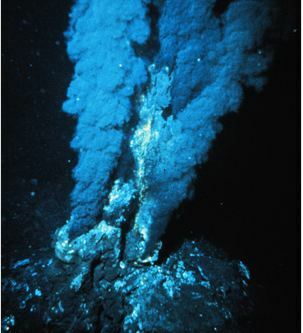 The minerals were found in areas which have, or have had, thermal vents at depths of 3,500 to 6,000 metres (11,500-20,000 ft) in international waters east and west of Hawaii, and east of Tahiti in French Polynesia. The British journal Nature Geoscience reported that a team of scientists led by Yasuhiro Kato, an associate professor of earth science at the University of Tokyo, found the minerals in sea mud at 78 locations. 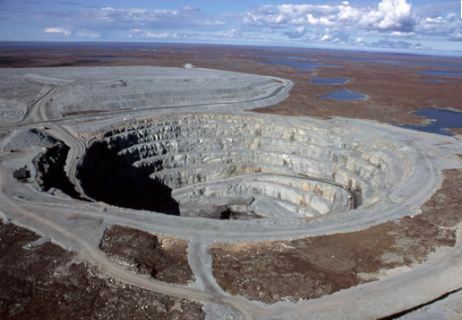 “The deposits have a heavy concentration of rare earths. Just one square kilometre (0.4 square mile) of deposits will be able to provide one-fifth of the current global annual consumption,” said Yasuhiro Kato, an associate professor of earth science at the University of Tokyo. It’s Not a Pipe Dream as the number of firms seeking licences to dig through the Pacific Ocean floor is growing rapidly. The listed mining company Nautilus has the first licence to mine the floor of the Bismarck and Solomon oceans around Papua New Guinea. It will be recovering what is called seafloor massive sulphide, for its copper and gold content. 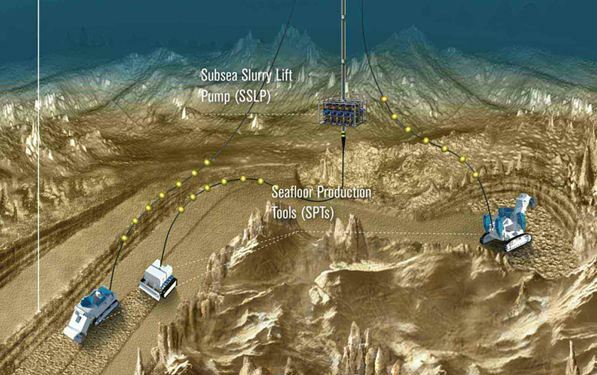 The Sea Floor Will Be Unprotected as this new style of mining develops. All we will see is a ship sitting on the ocean. What we will not see are the clouds of silt and muck being stirred up my the mining activity. Nor will we see the extinction of colonies of deep sea life which we still do not understand. The time to act and create protections for the sea floor, its life-forms and its still unknown value to human beings may already have passed. Nautilus are looking at mining permits from Governments who control the small bit of sea floor where they currently have interests. The real worry is the open sea. 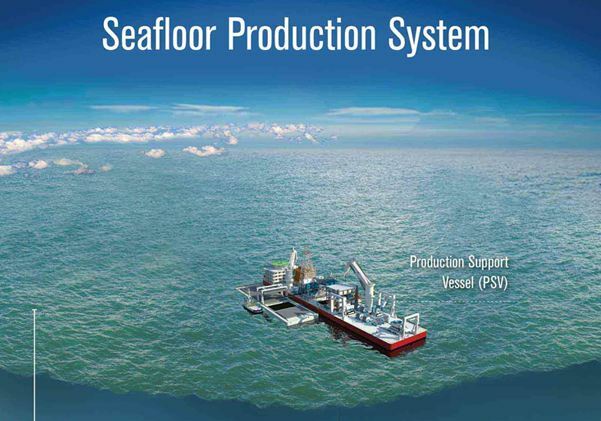 Where no Government rules and giant corporations will be able to exploit the resources of the sea bed without oversight. Land Based Mining Will Become Too Expensive and those countries which are relying on mining royalties and mining employment are all in for a very rude shock. Within ten to twenty years land-based mining companies will have a new big stick to wave around at resource-based economies. Give us what we want cheaper or we will go where there are no mining royalties, no taxes, no environmental worries! In the meantime we are all oblivious to the ramifications. The debate on Global Warming and a Carbon Tax continues and my rare earth shares have gone up 6% today. 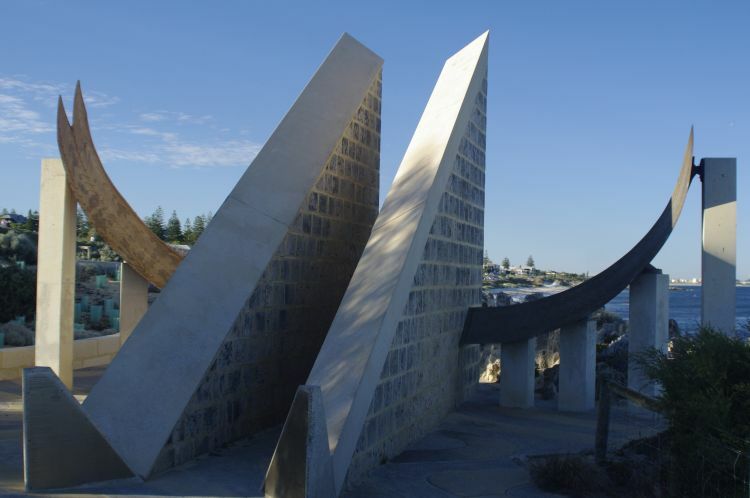 It is the chart for a large (and quite accurate) sundial near Cottesloe Beach in Perth. 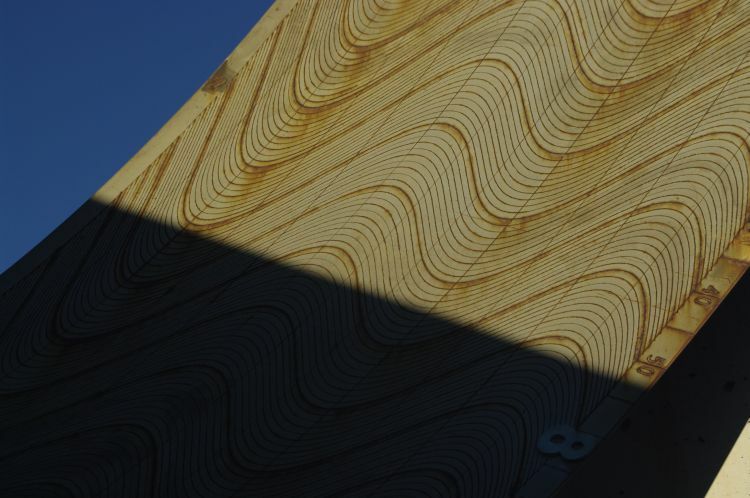 The wavy lines are how the time is estimated. The longitudinal straight lines enclose the months (January is next to the numerals) and the wavy line is where you tell the time for whatever month you are in. In this case, this morning was 16th of April so I looked at the shadow half way between the third and fourth month line and picked the time as near enough to 7:47am.